Medway Council’s support for Lodge Hill and concreting over a bird sanctuary to build 5,000 houses played a key part in my decision to leave the Conservative Party and join UKIP. The Conservative Council’s plans, supported by both Labour and the Lib Dems have now, after months of our campaigning, been stopped in their tracks. In an extremely welcome announcement today, acting in a quasi-judicial capacity, the Department of Communities and Local Government has decided to ‘call in’ Medway Council’s decision – see letter below. 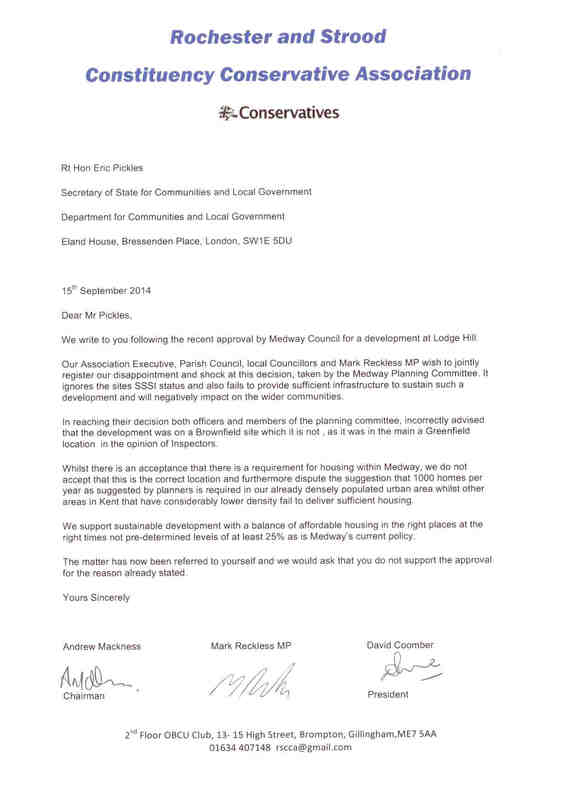 This means Lodge Hill cannot proceed pending a full Public Inquiry. 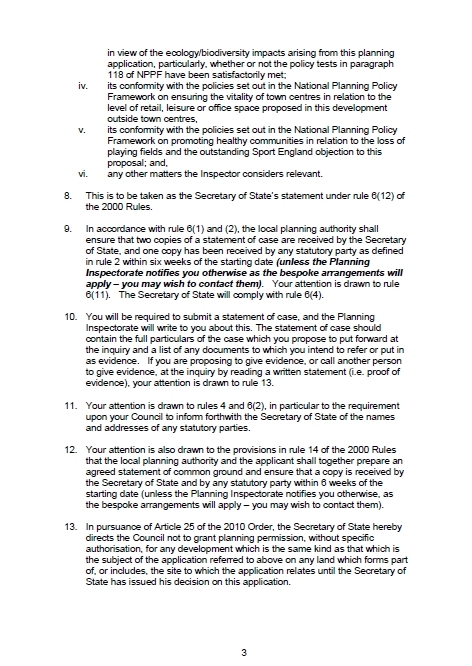 In particular, this will consider how on earth Medway Council could possibly think it right to approve Lodge Hill when the National Planning Policy Framework states “proposed development on land within a Site of Special Scientific Interest should not normally be permitted”. I am absolutely delighted at this news. It is a remarkable win for all of us who oppose destruction of this special site following its designation as an SSSI. I believe this is a vindication of my decision to call a by-election and put Lodge Hill at the forefront of my campaign, putting the environmental devastation that would have resulted from the Council’s decision at the centre of national debate. Today is a very big victory, but I will not rest until we have won the war and defeated Medway Council and its Lodge Hill development at the Public Inquiry. 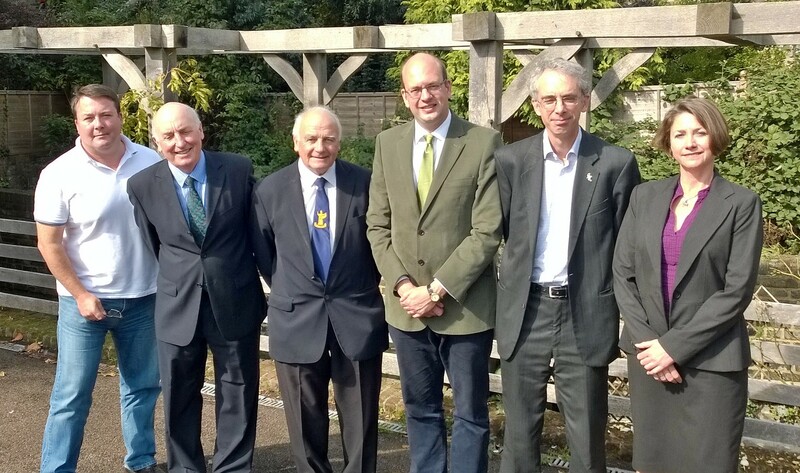 Mark Reckless (Rochester and Strood) (UKIP): It is a privilege to follow the hon. Member for Congleton (Fiona Bruce), who I am sure speaks for the whole House in her moving and compelling contribution. The hon. Member for Harrow West (Mr Thomas) spoke about Transport for London, and the ridiculous plans of the Mayor of London and Transport for London which no one could do anything about. He gave two examples, one of which was a Thames estuary airport. I am pleased to say that we could do something about that, following a fantastic campaign, which the Airports Commission said generated more representations than any other. I was privileged to lead that campaign with people from the Hoo peninsula and elsewhere in my constituency, but also with people from across the country and beyond, so that on 2 September this year, the Thames estuary airport pie-in-the-sky proposal promoted by the Mayor of London was categorically ruled out. Unfortunately, two days later, Medway council’s own planning committee attacked the Hoo peninsula with its own threat—a very serious threat—to build approximately 5,000 houses at Lodge hill, a bird sanctuary in my constituency. Two days after we had had the dreadful threat of the Thames estuary airport ruled out, we had this other one to deal with. Five days later, Medway council had to refer the application to the Secretary of State to consider whether it should be called in. 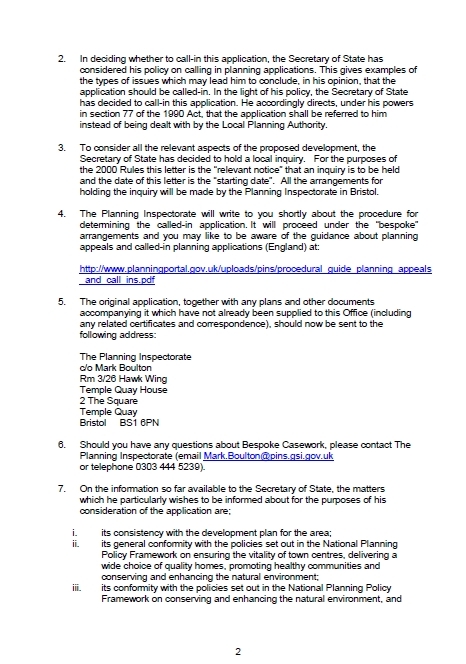 The criteria used for planning application call-ins used to be called the Caborn criteria. Three of those criteria appear to be met very clearly by this application to the extent that a call-in is required. The first relates to conflicting with national policies on important matters, notably the protection of sites of special scientific interest—and, indeed, the whole integrity of our system of environmental protection. The second relates to having significant effects beyond the immediate locality. It could even have an effect as far away as west Africa, where the nightingales that are the cause of this area becoming an SSSI spend the British winter. There could be an impact on Essex, because the planning committee of Medway council has, in its wisdom, accepted a proposal that the nightingales can be told to go to an alternative location somewhere in Essex. We do not have much in the way of detail, but this clearly suggests significant effects beyond the immediate locality. Perhaps most importantly, approving the proposal or failing to call it in and seeking to nod it through with a green light could have impacts on other SSSIs across the country. The third criterion is where the development would give rise to substantial cross-border or national controversy. Having been at the centre of such controversy during the recent Rochester and Strood by-election, I can vouch for that. On 25 September, the Secretary of State for Communities and Local Government recused himself from considering the application on the basis that he is a member of the Royal Society for the Protection of Birds. Two days later, I recused myself from the Conservative party and was determined to fight a by-election partly on this issue. Since the Secretary of State recused himself, the matter has been considered by the Minister of State, Department for Communities and Local Government, the hon. Member for Great Yarmouth (Brandon Lewis). He wrote to me on 15 October, and I was glad to hear that no ministerial decision had been taken on whether the matter should be called in. He criticised what he described as my claim that such a decision had been taken. Of course, that was not my claim. It was a claim made by the deputy leader of Medway council, Councillor Alan Jarrett, in a meeting of Conservative councillors. His statement was that it had apparently been communicated to him by the Government that the proposal would be green-lighted and would not be called in. That led to another councillor present at the meeting, Councillor Peter Rodberg, leaving the Conservative group and joining me in UKIP. He says—and this is borne out by another councillor who has spoken to me, and who remains a Conservative—that at the end of the meeting, after the councillors had been told that the Government would green-light the proposal, Councillor Peter Hicks, who represents Strood Rural, said that they should keep quiet about it until after the election. It was a pleasure to learn from the Minister that he was dealing with the issue of the call-in properly. He clearly recognises that he is acting in a quasi-judicial capacity, and—at least in terms of the time that he has already devoted to the issue and the correspondence that he has issued—he appears to be performing his duties with diligence. 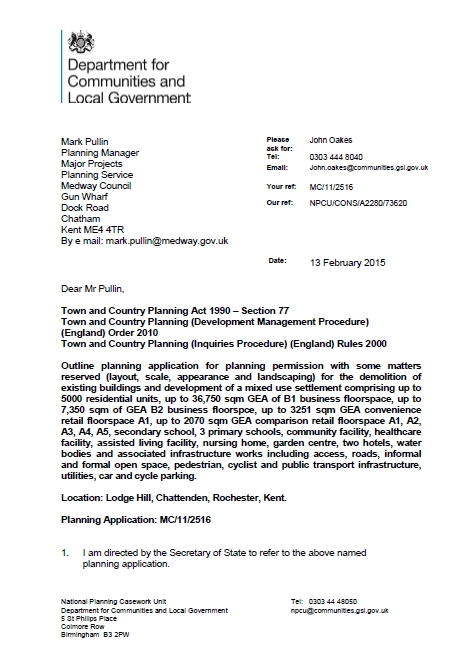 His most recent letter was written on 8 December to Councillor Rodney Chambers, the leader of Medway council. I understand that since this Government have been in office no more than a dozen applications have been called in each year, whereas under the last Government about 30 a year were called in, but I am not aware of any precedent for such a letter. The Minister wrote asking for Medway council’s views, and in particular the views of the planning committee that had considered the application on 4 September, on a number of representations that had been received, including representations from the RSPB and Natural England. Unfortunately the Minister did not attach the representations that he said he had attached to the letter, and, as far as I know, they have not been published. The letter is peculiar, however. It is not clear whether Medway council’s views were being sought, or the views of the planning committee, or both, and it is not clear how any conflict between them should be resolved. The planning committee meeting was, of course, on the record, so the extent to which it has considered—or, one suspects, not considered—the matters that it should have considered should have been made clear either in its decision notice or in the record of that meeting. I therefore question the credibility and reliability of any ex post facto justifications that Medway council may now produce for its decision, and any statement in which it purports to have abided by the national planning policy framework. Given that letter, given that at least three of the criteria for call-in were clearly met, and given the statement by the deputy leader of the council that the proposal would be green-lighted in the light of communications that he at least believed were taking place within the Government or among those who he thought could speak for them in respect of there not being a call-in, I think it is clear that the safest and, indeed, the only appropriate option is for the Government to call in the application, appoint an inspector, and give proper consideration to what is, in my view, an incredibly damaging application. This application would result in the pulling together of several villages into a single conglomeration, and would cause a site of special scientific interest to be almost completely built over, which would undermine the whole system of environmental protection in this country. It should now be considered by an inspector and then by the Secretary of State, and, hopefully, turned down as a result. Last month Medway Council approved plans for a new town of 5,000 houses in the middle of a bird sanctuary at Lodge Hill. Chattenden, Hoo, High Halstow and Cliffe Woods could, with this, become almost one conurbation. However, the decision still had to be approved by government. 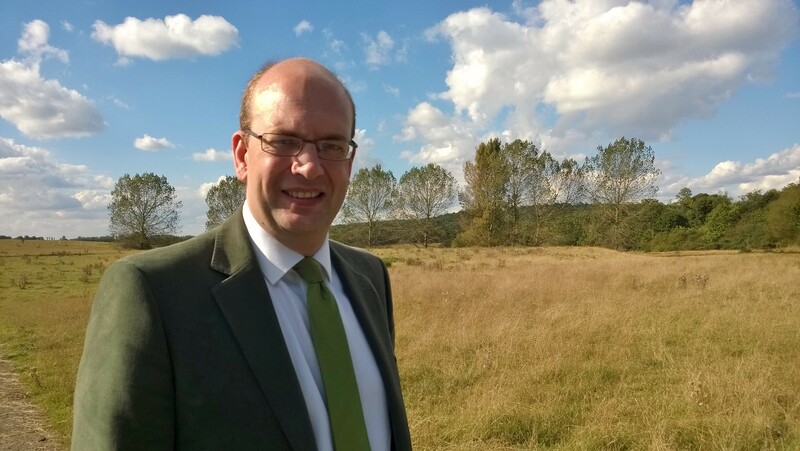 Mark Reckless, the RSPB and many local residents petitioned the government to “call in” the decision and have it reconsidered by a planning inspector. This is justified because the country’s whole system for protecting the environment will be undermined if building is allowed in this Site of Special Scientific Interest that is home to the UK’s largest nightingale colony. It appears however that Conservatives in government have secretly told Medway’s Conservative council that Lodge Hill already has the green light. 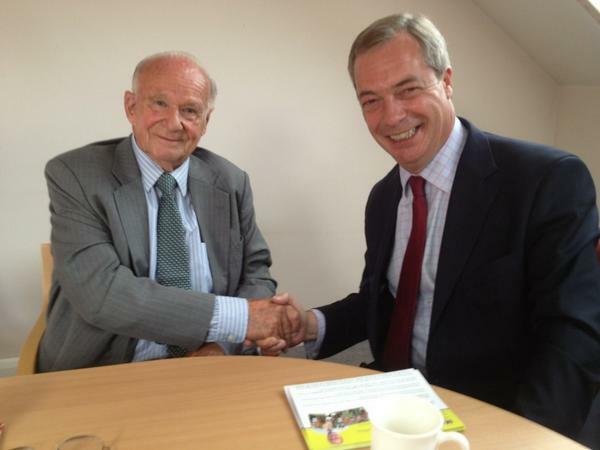 Councillor Rodberg has now given up on the Conservatives and is joining UKIP to fight Lodge Hill. Peninsula Councillor Chris Irvine has also left the Conservatives to join UKIP stating that the Lodge Hill decision was a “death sentence for our communities”. 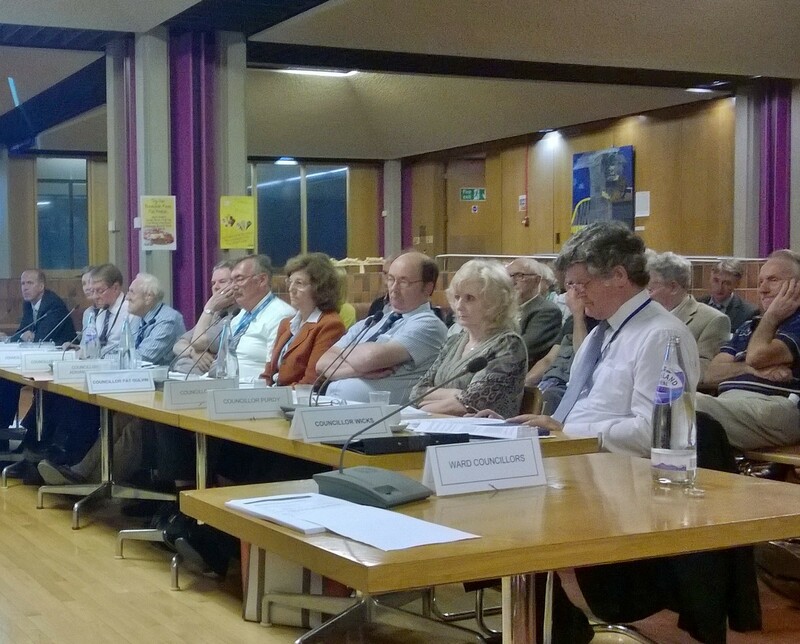 Medway Council has failed to agree a Local Plan and their Lodge Hill decision may be overturned by the courts. This means that other applications to develop our countryside are at greater risk of being approved. Landowners have submitted bids for where they would like to cash in by concreting over our green fields. The Conservatives on Medway Council had suppressed this information but UKIP has obtained a copy of the map. UKIP has managed to get hold of the map which the Tories don’t want you to see. We have reproduced it above. 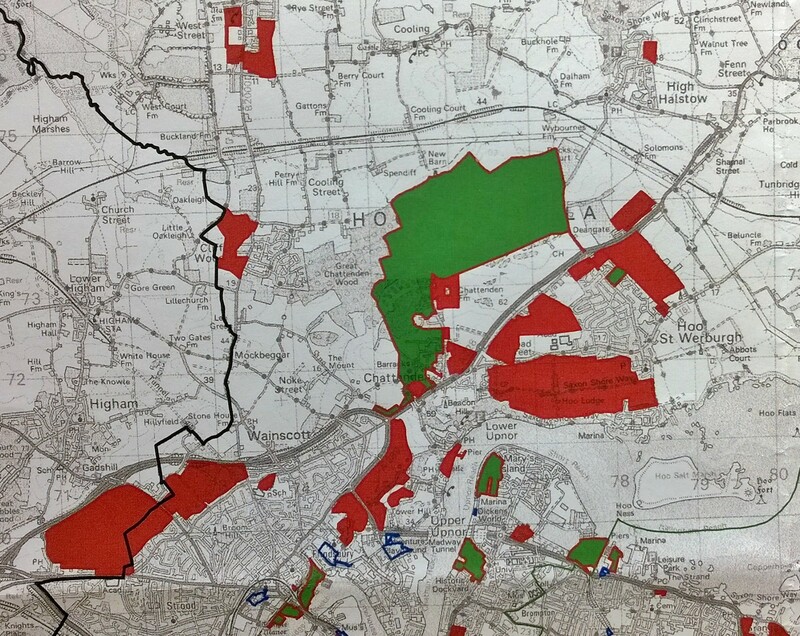 Following the unanimous decision made by Tory and Labour councillors on Medway Council’s planning committee to allow bulldozers to move into Lodge Hill, huge swathes of the Hoo Peninsula (highlighted in red on the above map with Lodge Hill in green) are also under increasing threat. Developers are eager to concrete over our green fields and protected sites with help from the local Conservatives. Only Mark Reckless and UKIP are standing up for residents on the Hoo Peninsula who have been ignored and who have suffered at the hands of the Tory elite, both locally and nationally, for far too long. It’s time for REAL change! If you want to stop the Tories, if you want to protect the Hoo Peninsula, our communities and wildlife, if you want to make sure your voice is heard loud and clear all the way to Westminster, please give Mark Reckless your vote in the forthcoming by-election. The Hoo Peninsula Is Under Threat And I Need Your Help! Following the appalling decision by Medway Council’s planning committee to green-light development at Lodge Hill on the Hoo Peninsula, there is now a clear and present danger not just to Lodge Hill and, as a result, other potential sites for development on and around the Hoo Peninsula, but also nationally if Medway Council is allowed to drive a coach and horses through the regime which protects Sites of Special Scientific Interest (SSSI) such as Lodge Hill. I am asking you to take five minutes of your time to help me convince the Secretary of State, Eric Pickles, to call in this decision for further examination. The deadline is midnight on 25th September 2014. Medway Council’s decision, announced on 4 September – two days after we successfully won the battle against the Mayor of London’s proposals to concrete over the Hoo Peninsula, will directly destroy 144 hectares of the SSSI, one of the largest losses of a SSSI since the Wildlife and Countryside Act came into force in 1981. The decision is in direct conflict with the National Planning Policy Framework (NPPF). Lodge Hill is a protected site and one of the most important ones in the country for nightingales with around 84 pairs of nightingales present on the site. There has been a rapid decline in nightingale numbers, up to half of the population has been lost in the past two decades. Lodge Hill is one of those rare environments in which the birds are apparently thriving, though nobody, including the RSPB, is quite sure why. It was therefore hugely disappointing when Medway Council’s planning committee decided to ignore expert advice and the strong views of local residents and ward councillors in approving the Outline Planning Application. Particularly galling is the fact that many of the councillors sitting on the committee that evening, none of whom were from the Hoo Peninsula, had already hypocritically stated their commitment to doing all they could to stop homes being built on land at Capstone Valley which does not enjoy the same level of environmental protection as Lodge Hill. I believe the council’s decision is simply not credible and I intend to fight it. I need you to join me and thousands of others in writing to the Secretary of State, asking him to ‘call in’ Medway Council’s decision. 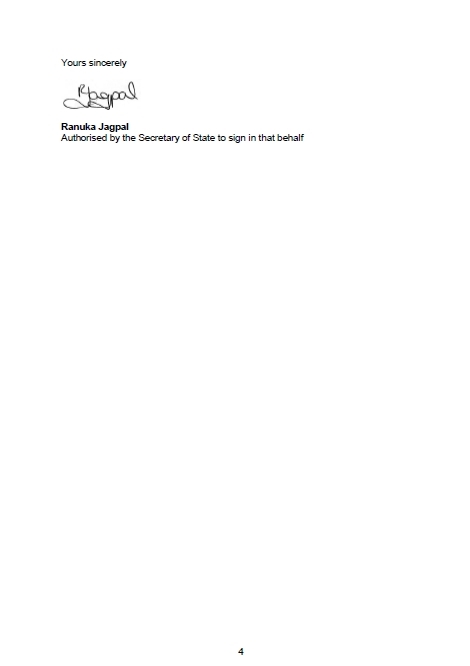 You can do so in your own words by directly emailing eric.pickles@communities.gsi.gov.uk. Alternatively the RSPB has set up an online form which you can access by clicking here. The future of our rural communities and the unique environment on the Hoo Peninsula is under threat. Join me and act now before it’s too late! 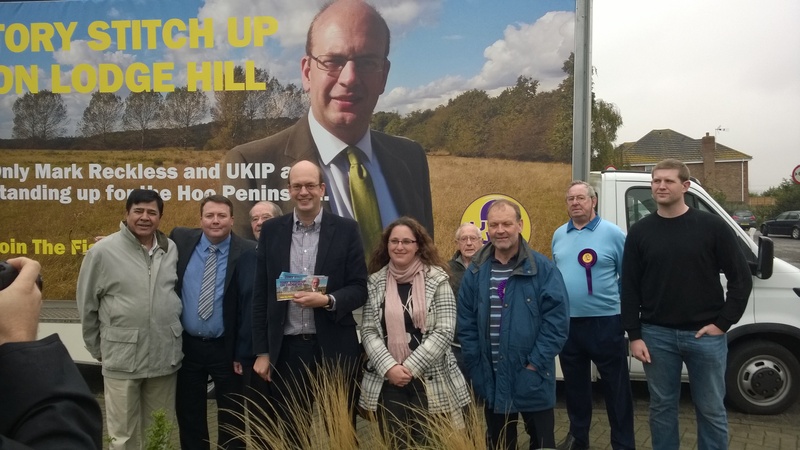 Speaking on BBC South East Today, Mark Reckless condemned the decision by Medway Council’s planning committee to green light the destruction of Lodge Hill in Chattenden which would devastate rural communities and villages on the Hoo Peninsula and Strood. Mark Reckless MP has condemned the decision by Medway Council’s planning committee last week to green light 5,000 dwellings on the former MoD site in Chattenden on the Hoo Peninsula which, only last year, was designated as a Site of Special Scientific Interest due to its nightingale population. 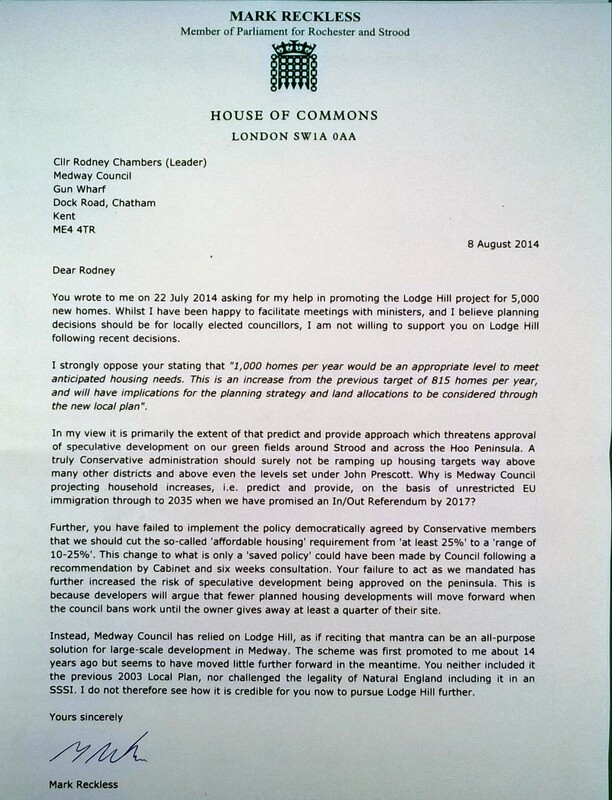 In his recent letter to the Leader of Medway Council, Cllr Rodney Chambers, Mark expressed his concerns about the scale and scope of development not just at Lodge Hill but across the Hoo Peninsula as a whole and made it clear that he would not be supporting this. Despite the strong representations made on behalf of local residents by councillors from Peninsula and Strood Rural wards, Medway Council’s planning committee voted unanimously in favour of the Lodge Hill development, a decision which could have serious repercussions not just for residents living in Strood and on the Hoo Peninsula but also in terms of potentially undermining SSSI protected sites across the country and the government’s own National Planning Policy Framework. “I am appalled that Medway Council’s planning committee chose to ignore the clear message from local residents and their elected representatives that this development should not proceed, particularly following the very welcome decision earlier in the week ruling out a Thames Estuary Airport. 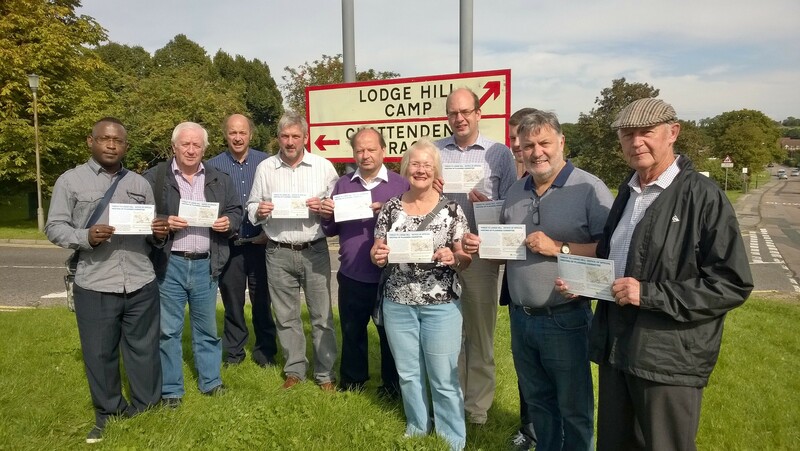 Having reviewed the environmental evidence following the independent inspector’s findings in relation to Lodge Hill, and further considered the impact which this would have on our local infrastructure, I am bewildered by the committee’s decision to give Lodge Hill the go ahead.